The towns of Magome and Tsumago used to be typical waypoints on Nakasendo, the road between Tokyo and Kyoto during the 1600s and 1700s. Now they’re impossibly picturesque villages that look unchanged since the days of the shogun, with a scenic, peaceful trail running between them. This was one of my favorite Japanese weekends away. The trail is about 8 km long and should take about two hours to stroll. It is easy to follow with frequent signs in English. It meanders through forests and settlements and along rice paddies, crossing the road at several points. It’s a little easier to start from Magome because it’s higher than Tsumago so you’ll have a net downhill. 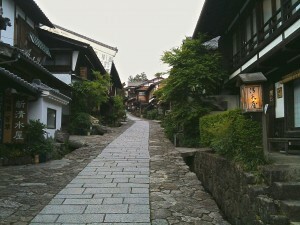 Both villages have nice-looking ryokans that look ideal for spending the night. Guests pad around in their inn’s yukatas (cotton robes) and eat dinner in the humble dining room. These inns looked more rustic than posh, but a step up from hostels. 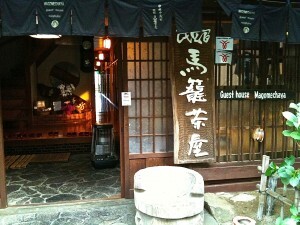 You could also stay in an onsen (hot springs resort.) The real benefit of spending the night is that you get to enjoy the town in the evening and early morning, before the busloads of tourists show up. I was quite taken with Tsumago. Magome, which seemed a bit more commercial looked intriguing, too, but I only enjoyed it for a few minutes in the morning before the hordes appeared. Both towns have parking lots. 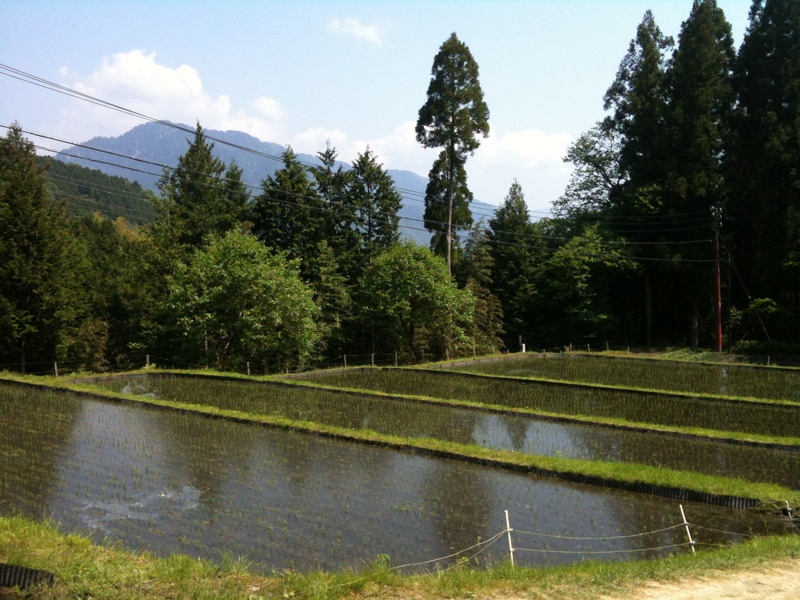 The lots in Magome were much larger but you have to pay to use them. From March to November, the towns operate an inexpensive baggage-forwarding service. Drop your luggage at either town’s tourist information office in the morning and you can pick it up at the other end by 1pm. There’s also a shuttle bus that runs between the towns in the high season. It takes at least four hours to drive from Yokota, so it can be done in a regular weekend, but it would be better to do this over a long American holiday weekend to avoid the crowds. Tsumago’s tourist information center can help you book accommodation: Tel: 0264- 57-3123. Magome’s information office (Tel: 0573-69-2336) might offer the same service, but it does not have an English website. You can always ask the helpful guys at the Yujo Center for assistance. 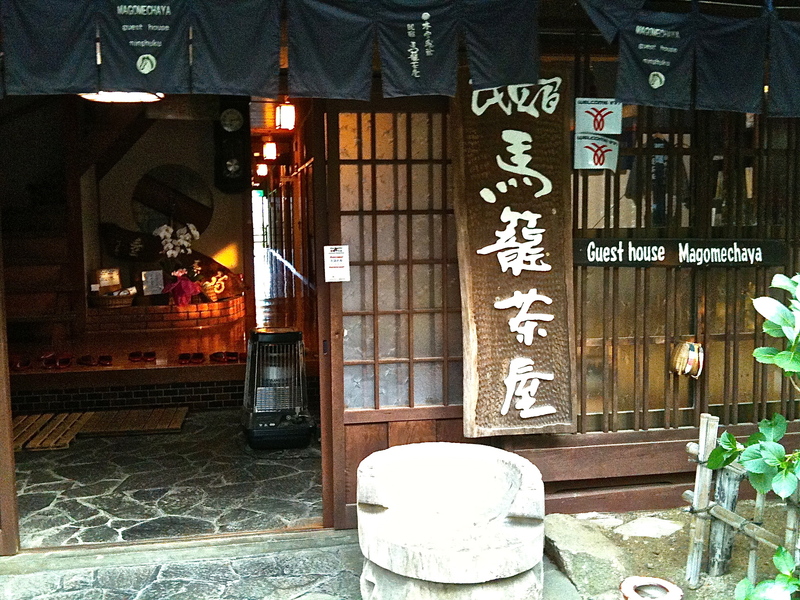 The site Japanese Guest Houses lists a few inns in Tsumago and Magome. For more information about the towns, try here. GPS for free parking lot in Tsumago: 35.57658, 137.59447. DIRECTIONS: The drive from Yokota to Tsumago is about 300km, nearly all of it on the Chuo Expressway. (See the map below.) At Lake Suwa, where the Chuo and Nagano Expressways meet, stay on the Chuo, which at Suwa takes a sharp turn to the southwest, toward Nagoya. Alternatively, if you don’t like expressways or you have more time, keep heading toward Nagano a couple of exits, to the Shojiri Interchange. Exit the expressway here and pick up 19, the Nakasendo Highway, which takes you through the Kiso Valley. The distance is about the same but the valley route is more scenic. Liz Ruskin, 2012. This entry was posted in Top 5 Weekends, Weekend Trips. Bookmark the permalink.